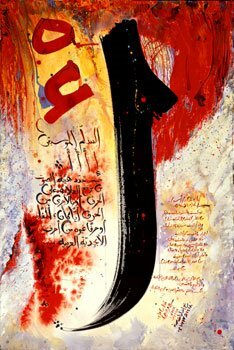 Muhyiddin Ibn 'Arabi is known as "the greatest Shaikh or teacher" and "the pole of Knowledge" in Sufism. He was born in 1165 in Murcia, Spain and died in 1240 in Damascus. According to Annemarie Schimmel his influence "on the general development of Sufism can hardly be overrated. For most of the Sufis after the thirteenth century his writings constitute the apex of mystical theories." This post is an excerpts from, "The One Alone," which was reproduced from his extensive treatise on the spiritual practice, "What the Seeker Needs." This article sheds a very different light on the idea of God, our own self and the grand idea of knowing oneself. Please do take note that the truth has many dimensions and without excluding the other dimensions, each can be true. Ibn Arabi was a great philosopher who's spiritual ideas and thoughts were tremendously advdanced even for our age. Here you may find a rare thesis about the whole idea about self and God. I'm just quoting few paragraphs. In the Name of Allah the Merciful, the One Who is visible with All His beautiful names and attributes in the realm of images. The Master, the Light of the Universe, the Prophet Muhammad (may Allah's peace and blessings be upon him), said: "I know my Lord by my Lord". He also said: "He who knows himself knows his Lord". By this it is meant that, surely, you are not you, and you - without being you - are He. He is not within you; nor are you in Him. He does not exclude you; nor are you excluded from Him. When you are addressed as you, do not think that you exist, with an essence and qualities and attributes - for you never existed, nor do exist, nor will ever exist. You have not entered into Him, nor He into you. Without being, your essence is with Him and in Him. You were not; nor are you temporal. Without having any identity, you are Him and He is you. If you know yourself as nothing, then you truly know your Lord. Otherwise, you know Him not. You cannot know your Lord by making yourself nothing. Many a wise man claims that in order to know one's Lord one must denude oneself of the signs of one's existence, efface one's identity, finally rid oneself of one's self. This is a mistake. How could a thing that does not exist try to get rid of its existence? For none of matter exists. How could a thing that is not, become nothing? A thing can only become nothing after it has been something. Therefore, if you know yourself without being, not trying to become nothing, you will know your Lord. If you think that to know Allah depends on your ridding yourself of yourself, then you are guilty of attributing partners to Him - the only unforgivable sin - because you are claiming that there is another existence besides Him, the All-Existent : that there is a you and a He. Our Master, the Prophet (peace and blessings be upon him) said, "He who knows himself knows his Lord." He did not say, "He who eliminates himself knows his Lord." :: The complete article is here.